The reason I wanted a Raspberry Pi initially was to log temperature. My small 6ft x 8.5ft garden room has such varying temperatures that my heat mat thermostat can’t keep my seedling warming mat at a stable temperature. In the evenings the temperatures get low and when the sun is shining it is very warm. I needed to get a handle on what the temperature is in the room so that I can stabilize it. There are many other temperature loggers out there. I was unable to find one within a similar price range that functioned the same way. 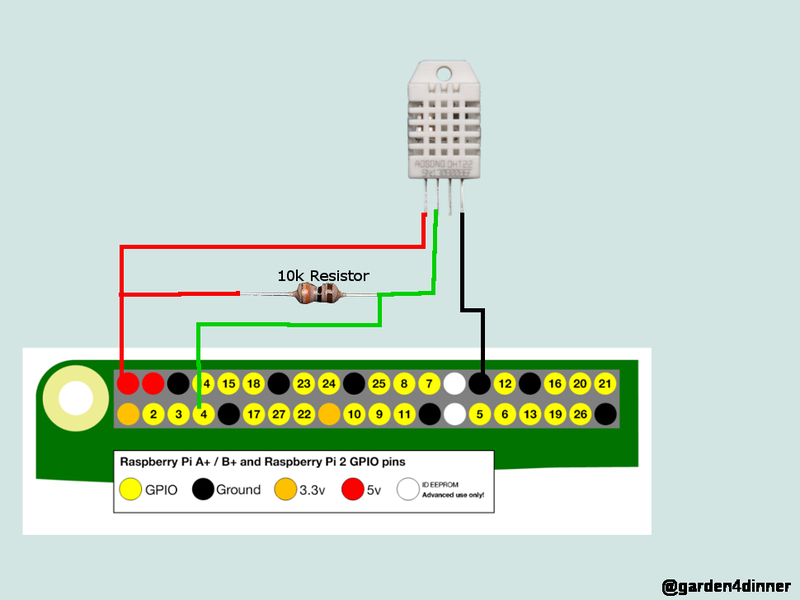 Additionally, I plan to use the Raspberry Pi for other automation also. The less expensive temperature loggers I found were generally USB dongles, which I worry would measure some of the computer temperature in the reading because of the proximity. I would also need an additional machine to plug the dongle into. I decided on the DHT22 temperature sensor . Another benefit to the DHT22 is that it is a humidity sensor also, which I think will be useful in the future. Plus, did I mention putting it together would be fun? I do have electrical and software engineering experience. If I had no experience at all, I would have purchased something already made. Putting everything together was surprisingly easy. I started with my Raspberry Pi that I already set up and configured. 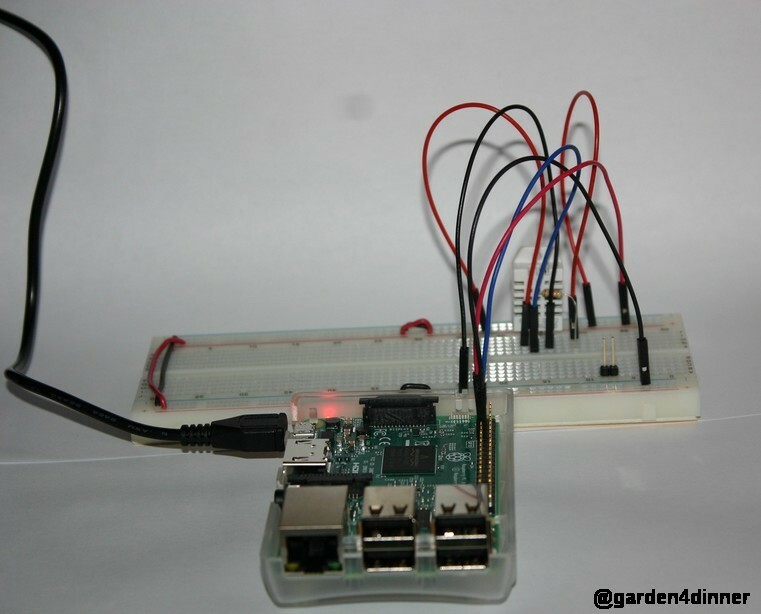 I will list out my resources and steps to set up the temperature and humidity logging next. Location of the software: https://github.com/adafruit/Adafruit_Python_DHT (The repository source URL is on this page). After using those four websites to hook everything up and install the default software, it needed to be configured. I started by following the instructions in the readme file included in the software I downloaded. My pinout above shows pin 4 used for GPIO, but it would have been easier if I used pin 23 instead, because it is the default configured pin in the software. As part of the instructions at the beginning of the file, I changed DHT_PIN to the pin I have hooked up (from 23 to 4). Additionally, I generated credentials using Google’s instructions. I had to create a new project under the google spreadsheet API. A part that I didn’t see documented was that when I was creating my service account key, it forced me to choose a Service account. I selected Compute Engine default service account and that worked for me. Where Filename.json is my filename. My other problem is that it was adding 1000 blank rows before the temperature logging. After some research, I found the solution is to delete the 1000 blank rows. After I figured out how to do all of this I found this website that looks like it contains all of the steps I went through in more details. To the end of the /etc/rc.local file before the exit 0 command. I didn’t time how long this took me, but I was amazed that it took me less than 2 hours. I do have electronic, Linux, and software experience. For a newbie, I would expect for it to take longer learning how to do it all. It is a fun project and I am looking forward to adding additional sensors for gardening in the future. It is great to be able to check the temperature on my phone easily with Google Spreadsheets at any time of the day and see how much it fluctuates throughout the day! Do you have any automation in mind for your gardening? Would a temperature and/or humidity logger be useful for your gardening? What would you use it for? Automating stuff for your greenhouse sounds like a fun project! I would be interested to hear how it goes when you get around to it. I have more automating planned, I will be sure to share the results. I have to look in to this. I been trying to find a thermometer that would do just this, with out much luck. All I have now is highs and lows on both temp and humid, but only till I reset. It is fun and nice to have total control of the data collected. If you end up trying this, let me know!